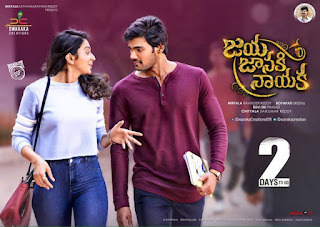 There is nothing to narrate the story, Regular commercial Mass masala entertainer film where there was a rich guy Gagan(Sai Srinivas) fells in love with Sweety(Rakul Preet) who has some issues from the family, Gaagan helps her from that mess, He kills the villans. Sounds so regular? yeah this is what the film story is. Boyapati Srinu is now marked a Pakka commercial director after VV Vinayak who is coming up with the regular mass masala content that offers nothing new to the audience. This film looks like director has written few scenes between the fights, Every scenes that gives a lead for the fight, Except action sequences there is nothing much in the film. The love track between Rakul and Sai Srinivas also looks so artificial. No songs were catchy except Nuvve Nuvvele Song, but that was pictured worst in the film. I don't understand when this gut Sai Srinivas learns acting, he is only good at dancing and fights. Boyapati marked this as a family entertainer film, how come this will be family entertainer? if a film story contains family then will it become a family entertainer? then what should we call the films live SVSC and Shathamanam Bhavathi? This is a clear cut loudest mass masala film with logicless scenes that leads to action sequences. Get away from the film if possible.